The cultural intersection between Passover and Easter came to a head at an interfaith panel Wednesday, when the topic of food was on everyone’s mind. Three faith-based leaders—Rabbi Aderet Drucker, Lisa Lytwyn and Jessica Senasack—were panelists who spoke at the Multicultural and Interfaith Lunch & Learn: Easter and Passover. Located at the Adele H. Stamp Student Union, the speakers talked about the relationship between religious customs and food preparation. For Passover, “the focus is on the journey from slavery to freedom,” said Drucker. It’s a time when people can recognize the struggle for Jewish liberation in ancient Egypt and discuss similarly-themed current events related to oppression and immigration, she said. During the first two nights of Passover, Jews embrace the ceremonial feast that is Seder and use these discussions to reflect. “You’re supposed to walk away from the Seder a changed person,” Drucker, campus rabbi and Hillel director of Jewish Life and Learning, said. Likewise, for many Christians, Easter is a time for families to gather, eat, and observe their religious practices in a much more structured, ritualistic fashion than a typical Sunday at church. The Americanization of certain holidays rooted in religious significance caught the attention of the panelists. Christmas, a day that commemorates the birth of the Christian messiah, Jesus Christ, is a much more commercialized practice that non-Christians and believers alike often celebrate, said Senasack. Drucker agreed, likening the materialistic importance given to gift-giving on Christmas to that of gift-giving on Hanukkah. For Christians, it’s their “most important feast of the year,” said Lynwyn. From left to right: The event host Nick Schmitz, Rabbi Aderet Drucker, Lisa Lytwyn and Jessica Senasack. Ambriah Underwood/Mitzpeh. Whether it’s donated, burnedor sold—a method Drucker said can be particularly useful for those who work at places that own leaven products like a bakery or liquor store—the removal of leaven is key. The elimination of leaven has symbolic meaning, Drucker said, as people get rid of things that have held them down or back. She said it’s something that is replicated physically, internally and spiritually. Through Catholic tradition, Lytwyn said, there’s the celebration of three successive days: Holy Thursday, Good Friday and Easter. “It’s just a very beautiful time,” said Lytwyn. Alexya Brown, a sophomore behavior and community health major, said that the event helped illuminate the intersection between Passover and Easter. 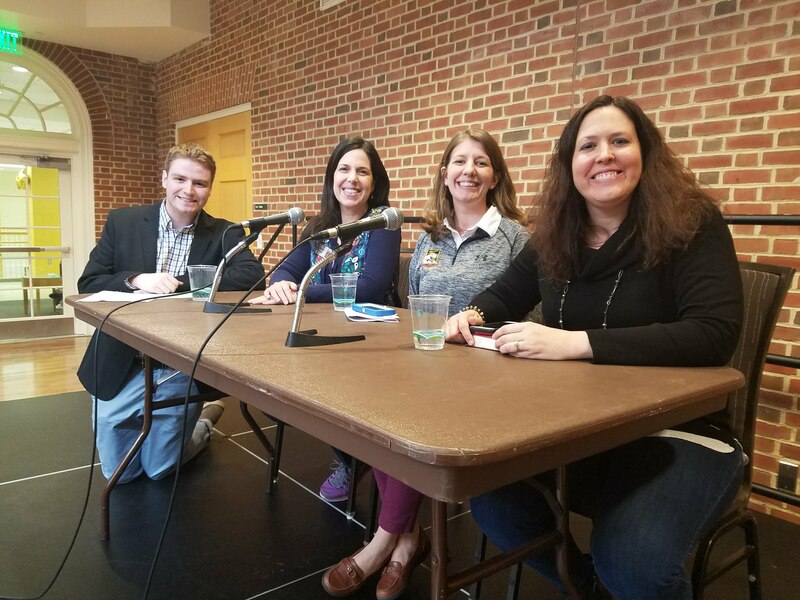 Host Nick Schmitz, the chair of the Interfaith Committee at Catholic Terps, pointed out that the panel was composed of three women who are leaders within their religious circles, something he said was a progressive feat. Senasack thinks that the Bible, while taking place during a period in which many women were considered property, also has some progressive moments like when a woman named Mary Magdalene witnesses Christ’s resurrection. “I think that it validates women,” said Senasack. While one meeting can’t possibly cover the entirety of thousands of years of religious customs and practices, it’s an opportunity for students to take a step toward diversifying their sense of cultural understanding. No Replies to "Interfaith panel uses food to discuss relationships between Passover, Easter"